I've installed the Bootstrap theme and using the Cyborg option. 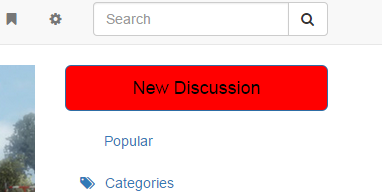 I'm trying to adjust the font size of topic titles as they come out too big, I was looking at the design/custom_cyborg.css but can't really see where to customize that. just change the size according to your preference. thanks rasteron, I'll give that a try. In which CSS file should I put that? That's great, thank you! This CSS Editor is neat. How did you determine that the class was "PageTitle"? In looking at the HTML source I saw it as HomepageTitle instead, but PageTitle as you mentioned, worked fine. Similarly, if I want to change the color of the button and text for the "New Topic" how do I find out what to customize in the CSS editor? change colors accordingly. hope that helps.